A free AAC audio encoder/decoder supports multiple language. - Solved problem of richedit , to exchange ListView component. - Do not erase file list if it stopped encoding by user. - More file extentions for AAC encoded. 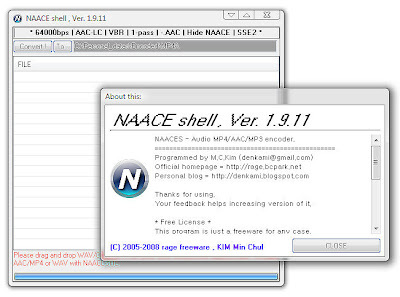 - Decodes AAC audio files to WAV. - Automatically identifies system functions and applies for AAC encoder. - Execute file , it may complete installation automatically. - You could be see a new blue and white N icon on your wallpaper. - All free , there is no payment , no donation.